The DEFINE STATGRAPH statement tells PROC TEMPLATE that you are defining a new graph template (instead of a table or style template). The template is named mygraphs.mcmc. There are two dynamic variables: _sim and _parm. 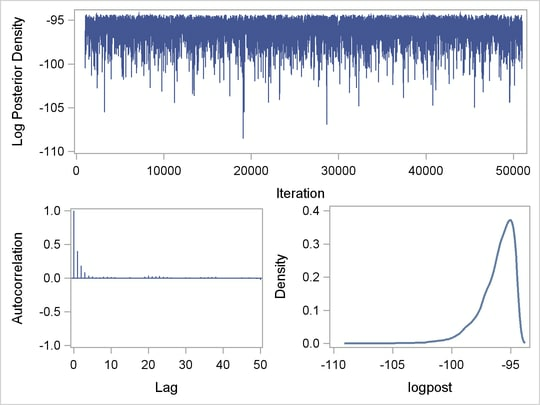 The variable _sim is the iteration number and the variable _parm is the variable in the data set that stores the posterior sample. All STATGRAPH template definitions must start with a BEGINGRAPH statement and conclude with a ENDGRAPH statement. The first LAYOUT GRIDDED statement assembles the results of nested STATGRAPH statements into a grid, with two rows and 1 column. The trace plot (SERIESPLOT) is shown in the first row of the graph. The second LAYOUT GRIDDED statement divides the second row of the graph into two graphs: one an autocorrelation plot (NEEDLEPLOT) and the other a kernel density plot (DENSITYPLOT). For details of other controls, such as the labels, line types, see Chapter 21, Statistical Graphics Using ODS. The SGRENDER procedure takes the classout data set and applies the template MYGRAPHS.MCMC that was defined previously. The DYNAMIC statement needs two arguments, iteration and logpost. The resulting graph is shown in Output 52.11.